(THIS RP IS CLOSED) Lightning Bliss's Birthday Party RP! Private (THIS RP IS CLOSED) Lightning Bliss's Birthday Party RP! "Perfect, she's going to love it!" Night Lights smiled to the pink pony known as the party pony Pinkie Pie, "how do you do it if I may ask? All these decorations? You did this all yourself you claimed?" "Of course I did silly!" Pinkie smiled brightly and leapt off the roof as she finished hanging several hundreds of rainbow, black and white balloons. The entire square of Ponyville was full blown decorated with streamers of all colors of the rainbow, as well as black and white. Balloons tied to trees, lamp posts, houses and benches within the park. There were several tables decorated with brightly colored table covers, even the chairs were happily glowing with golden streamers and balloons on each one. On the more larger tables where heaping bowls of punch, cup cakes, chips and even Lightning Bliss's favorite, brownies and cheese fondue, all surrounding a five leveled cake. The cake in itself was fixed with all the colors of the rainbow in a sweet butter-cream icing, with chocolate cake and raspberry filling inside. And with the sun slowly being lowered down behind the town's hillsides, the whole area was lit up with rainbow candle light. Nights was overwhelmed with the beauty and cheerfulness of it, his mouth agape as he tried to find his words of how one single pony could accomplish so much. He approached her again, just as more town citizens approached into the party area and began to mingle. "But…but…" he struggled to find his words, "you are just one pony Mrs. Pinkie…surely you don't have magic. You are an earth pony right?" "Magic? Of course I don't use magic! I used my party cannon!" She squeed loudly before randomly pulling her little gray cannon out from behind her, displaying it to him proudly, "you asked for the best for your wife Lightning Bliss! But what you asked for in a short time I couldn't do on normal circumstances. So my party cannon did most of the work! I never leave home without it!" She looked to the crowd of ponies slowly starting to enter to the eating area, her smile got even brighter as the party was starting to get on the way. "Well go on Night Lights! Go get Lightning Bliss! Just as planned, as soon as you two get here, I'll kick start the music!" "Oh right! Will do!" He smiled happily to the pink pony, then took off towards the tree castle of Twilight Sparkle. "I just don't get it!" Bliss snorted as she trotted around the thrones of the castle with Twilight Sparkle and Spike, as well as a few of their friends Fluttershy and Rarity. She knew something was up, the three ponies and the young dragon were doing their best to keep her in the castle. "Why can't I go now? It's my birthday Twilight! I should be celebrating at home with my husband! And I've already done what you've requested of me with the pet play time, and reading of the Ponyville Law book." "I know, I know but please Bliss…" Twilight smiled to her hesitantly, clearly she was hiding something along with Fluttershy and Rarity, "we um… we still need to go over some things with Ponyville's um…"
"Animal shelter policies!" Rarity cut in, obviously trying to help Twilight distract the small white alicorn from the windows. "Um… we are trying to set up new policies for Fluttershy's animal shelter and adoption days… um… Right Fluttershy?" "Oh…oh yes um…" the yellow pegasus with pink mane and tail, spoke quietly, and shyly, she looked terrified in trying to find her words, "it's always a struggle to settle on proper days for um…hosting adoption days for the sweet little animals. They some times um…collide with…um…"
"They collide with other days that are hosted in Ponyville, like the running for Mayor, or the Wonder Bolts visits, you understand don't you Lightning Bliss?" Twilight smiled again, squeeing in the process. Bliss sighed heavily and nodded in understanding, "Ok…let's just get on with it then? I don't see why you need me for this Twilight… you're an alicorn Princess in charge of Ponyville… I'm just… an extra hoof when needed really…I'm more used for diplomatic situations and negotiations for other kingdoms." "Oh darling!" Rarity the white unicorn butted in, zipping in front of Twilight to distract her more, "but you are more then an extra hoof! You are an alicorn princess, and you have many duties that require your attention everyday! And it can be so overwhelming if its just one pony dealing with a whole kingdom's troubles. Surely you can understand that Princess Twilight now and then can use a hoof in running her own?" "Ya, since you don't have a kingdom of your own and…" Fluttershy suddenly bit her lip, "oh I'm sorry… I didn't mean anything by that…"
"It's ok Fluttershy I understand," Bliss nodded again, "it's just I was planning to celebrate my birthday party today with Night Lights, I had a small dinner planned out and everything…I just don't want it to get too late." "Hey don't worry about it," the purple dragon Spike spoke up and placed a claw on her shoulder, "you'll be out of here before you know it! Just buckle down and help Twilight real fast, and everything will work out fine! You'll see." She smiled to the small dragon's enthusiasm but his presence only made her think of her shape shifting dragon Night Lights. "Well… where are the documents to help sort out the dates? I am… kinda literal on the calendars? I try to plan everything I do when I can." "Oh just like me! Um…" Twilight began looking back and forth, "Um.. Spike? Could you find the…documents?" "Documents? But you told me we were supposed to distract Bliss with some punch and… OUCH" he cried out as Twilight kicked his tail, "oh right the documents! Got it!" He quickly scampered off into the castle halls. "Heh heh… he can be forgetful sometimes…" Twilight pawed the ground, seeming to get more anxious in the process. She had been trying to distract Bliss all afternoon with the special request of her husband Night Lights while Pinkie Pie got her surprise birthday party and festivities all ready to go…but now she was running out of ideas on how to keep the small white alicorn in the castle and away from the windows. "We've got to find something else to distract her…" Rarity whispered to Fluttershy in her ear. "But how?" Fluttershy whispered back, "we've tried everything. We've tried playing with her pet rats… which was hard for Angel, he was very jealous of her two older rats Nes and Gizmo…Aww they were so cute and soft and cuddly and-"
"Darling focus dear…" Rarity cut her off with a firm eye. "Oh right. And then we had her go through books about magic on animal transformations with Twilight. We even had her read the entire Ponyville Law Book…I'm all out of ideas Rarity!" "Don't worry ladies," Night Lights fluttered in above them, "there's no need to delay the inevitable any longer." "Night Lights?!" Bliss whinnied and flew up to him in a hug, "sweety I'm so sorry! Twilight was insist that I help her with some…"documents" but I promise you we'll do something for my birthday!" "Shhh…" he nuzzled her, "Thank you Princess Twilight, to you and your friends for helping me out. We're ready for her now!" Twilight and her friends sighed with relief as Nights escorted Bliss out of the castle. "Ready for me?" Bliss asked, "what are you up to Nights? What's going on?" "You'll see my sweet mare," he held her in her hooves and fluttered up to the tip of the tree castle and turned into the direction of the town square, "look there my love…Happy Birthday." She looked down, seeing rainbow lights and the entire town playing and partying in the streets. There was even a banner with her face and cutie mark on it, clearly showing letters that read "HAPPY BIRTHDAY LIGHTNING BLISS". She even spotted Pinkie Pie below, setting up music in the background. Bliss was overwhelmed with joy and wonder as Nights carried her down to the festivities where all there friends were waiting. "Let's get this party started!" Pinkie pie shouted as she nodded to Vinyl the DJ pony along with a band of zebra ponies starting up their music and choir in the background. Even Zecora was at the front, grabbing a mic with the head stallion of the band, singing together in harmony. "I…I…" Bliss was at a loss for words as she spotted all her friends joining in on the music and dancing around her happily, "I don't…know what to say…" She hugged her husband Night Lights, then galloped up to her friends and began her pony dance with them! "You know I hate my job sometimes..." An annoyed wolf sighed, looking to his watch. He was on a carriage pulled by a pegasi team on the way to ponyville. He had a face of both nervousness and annoyance. "It's one thing to be fashionably late, but it's another to be absent for the greeting of the mare of the night." He continued mostly to himself. The team pulling the carriage was minding the clouds as they hurried to the town. "I wish for once that a conference could be timely and organised, especially on the day of a princesses birthday!" "As I stared into those sweet blue eyes... no, wait, Anala's eyes are grey. Gosh, if I'm so in love with her, I should be able to remember these things... did I say that out loud?" Riley trotted away from the train station, and made his way to Ponyville. He gaped at the sight. Multicoloured balloons and streamers, snack tables, rainbow-coloured lights... there might as well have been a sign hanging up reading, "THIS PARTY IS GONNA BE EPIC". Without a second thought, Riley began hopping around the village, grinning like an idiot. A familiar brown unicorn with a fine casual suit smiled with his usual warm smile at the white alicorn mare as he danced calmly and bobbed his head to the catchy tune the orchestra was playing in the background. Good evening, miss Bliss! He bowed slightly at the princess. It is so good to see you again, my friend! Happy birthday! His horn began to glow as he pulled out a small crimson colored package with silver strings and a gift card which had an abstract picture of a tree on it with words underneath it saying: Ever growing, ever the wiser. Happy birthday. I bought you small present before I entered the train from canterlot! Hopefully you'll like it! He smiled widely and nodded respectingly, before grabbing a glass of apple cider and raising it above him. To you, princess Bliss! My old friend! Thunder had flown down to Canterlot. He only had time to put on his party shirt and rock pants. He flew down as fast as he could with a gift for Lightning. "Ooh, I wish Nitro was here..." Thunder stated. He landed and burst through the doors and skidded to a halt. Panting hard, he said. "Sooooo sorry I'm late." Thunder stated as he saw the ponies dancing. Her eyes lit up as Polaris came up to her. Grabbing the brown stallion in a grateful hug for him coming to the celebration. "Thank you Polaris, thank you for coming! I'm just...so overwhelmed with joy right now!" Her eyes watered up a bit as she read his gentle card and levitated his present over to the nearest table where others were leaving her gifts. "I'll open your present later Polly, I'm just so glad you are here! I hope I my birthday didn't pull you out of any important business in Canterlot?" Just then she was startled by an abrupt entry of a yellow pegasus with black stripes on his legs, she recongized him as a pegasus named Thunder Dash. He had skidded to a stop just outside the park area a few feet away from her and Polaris. "You're not late at all!" She called out to him, feeling more happy that so many ponies were coming to her celebration, "come and have fun! thank you so much for coming!" She smiled brightly as she continued to trot in front of her friend Polaris in their pony dance. "I'm just...so overhwlmed!!! Words cannot describe! I feel like I'm gonna burst like a rocket!" "Oh, thank Celestia." Thunder stated as he got himself together. He then decided to grab himself a drink before he went to the dancing area. "I really hope Bliss likes my gift." Thunder stated as he went to get some fruit punch out of the punch bowl and poured it into a glass. "Ah, right. How could I forget?" said Riley aloud. He galloped over to Lightning Bliss and took a bow. "Happy Birthday, Alicorn of Peace!" he said cheerfully. "Or shall I just call you Lightning Bliss? Anyway, here's your present!" He held up a box wrapped in silver paper and a red ribbon. Inside was an artist kit - a pad and acrylic paints. She blushed brightly as another pony, this time a red pegasus with yellow mane and tail approached her with another gift. Calling her the Alicorn of Peace made her feel a bit uncomfortable though at the start. She smiled to the stallion regardless and levitated the gift he gave her gatefully. "Thank you so much Mr. Riley," she smiled to him gratefully, "but you don't have to call me the alicorn of peace. It's just Lightning Bliss, or Blissy if you prefer?" She giggled to him and levitated the gift onto the table with the rest of the presents. She noticed they were really starting to pile up now. "Wow..." she mentioned to Riley, Polaris and Thunder Dash, "didn't expect this much in such a short time!" "Oh Lightning!" Thunder called out as he finished drinking his punch. He then gathered some electricity and made his gift appear. It was a crystal rainbow pendant in the shape of a heart with a peace sign engraved in the middle of it. Thunder hid it behind him so Bliss wouldn't see it. He shooked his head and smirked. Don't worry about my schedule, miss Bliss! I used one of my free days to come celebrate your birthday! Wouldn't certainly want to miss your parties for all the bits in equestria, since you always come before my job, friend! He shrugged with a sly smile at her astonishment. What can we say? We're full of surprises! "Okay, Blissy it is!" said Riley, smiling. "And you can just call me Riley. Or Rilea, if a unicorn accidentally turns me into a mare," he added with a chuckle. "But that's not very likely, is it? So... how many guests are coming besides us? I'm interested in seeing how this escalates." She hugged Polaris again, putting her hooves to her cheeks and swaying her head in a filly like astonishment. "Polaris you really are the best friend a mare could ask for!" She then abruptly looked around, hoping secret photographers from Photo Finish's staff weren't taking pics of her special day. Giggling a bit at that notion, but she didn't really want this to be a huge deal. Turning to Rliey at his joke, she laughed out loud remembering that one time accident she had with her friend Polaris and Skylar. "Oh I did that one time!" She giggled, "I was trying to learn a little magic from Twilight, and was trying to turn an apple into an orange, but I still don't know how it went wrong...Somehow the spell was spoken wrong or my concentration was thrown off because it not only turned the apple into an orange, but it turned me into a stallion, and my friends into mares!" She giggled at the horrific image now, knowing when it happened they all were panicking about it. "Luckily Twilight was able to help us reverse the spell, so no harm no foul." She turned around staring at Thunder as he shot lightning forth from his body, and...somehow turning it into magic and creating something from it but she couldn't see what he made. She sulked a bit deep inside, wondering if she would ever get that good with magic, yet here was a pegasus that could do more then she hoped for. Needless to say, she didn't want to be sulking on her birthday, she smiled happily to him and turned to him fully. "Oh what is it Mr dash?" She asked happily, "You didn't have to do anything for me! I'm flattered!" Riley chuckled at Bliss' story. "If I got turned into a mare, I would cry for hours. You know why? Because one of my best friends happens to be a mare. And I really like her. She's sort of stubborn and brash. But I know her well enough to tell you that if you dig deeper, you'll find a pony who's genuinely soft and caring." Thunder gathered electricity and made the box turn into a crystal rainbow pendant in the shape of a heart. Inside the heart was a gold peace sign. He levitated it down and put the pendant around Blisses neck. "It's all yours. Happy Birthday lightning." Thunder said. He shuddered at the Blissy's words when she made him remember the awkward situation he found himself on that day, but quickly shut the memory out of his head by shooking his head, before smiling sheepishly at the white alicorn mare. Yeah... That was a rather... Bizarre turn of events back then, miss Bliss! At least it was a good experience of how to see a world through a mare's eyes for a whole day! He chuckled warm heartedly. "Aww Thunder..." she blushed brightly as she looked at the magically created gift. She lifted it up to put it in the light and watch it glisten, "thank you so much! It's so beautiful! I'm gonna have a hard time keeping Night Lights from taking this for his hoard!" She giggled a bit for turning to Polaris, looking obviously embrassed from the private story she shared with Riley. "Aww come on Polaris, it wasn't that bad!" She chuckled a bit, "it was only for about 4hours! But then again..." She cringed at the thought that she was trapped in Twilight's home while she thought of a reversing spell. Seeing mares looking at her through the window when she was a stallion made her feel very awkward. "I'm just glad Nights didn't see me...I looked hidious!" She levitated a small cup of punch over to herself, followed by a brownie and happily sipped and munched before continuing. "One things for sure... no more transformation spells for awhile! Magic, schmagic! I was a pegasus first before an alicorn, I think I can live without all those fancy spells for awhile!" "Your welcome." Thunder said blushing lightly still staring at how beautiful Bliss was. "She sure is lucky to have a loving husband like Night Lights..." Thunder thought to himself. He then went to the dance floor and started to dance still thinking about Bliss. At the mention of "transformation spells", Riley chuckled as he recalled 'The Plushie Incident" when he and Anala had met Escapade. "I came across a transformation curse once," he stated. "And at the same time, Anala and I met an explorer who happened to be in search of the artifact the curse came from. Things escalated quickly that day..."
Roac was charging through the streets of Canterlot. And he was going to be late to Bliss's party. In Ponyville. He hadn't even picked up her gift yet! Checking his watch, he decided that now was the time to use the eye. He pulled off the eye patch that suppressed it and hung it around his neck, causing time to slow around him as a small trail of dust forms in front of him, leading to the workshop of Mystic Rivet. Roac appears behind Bliss, wearing a brown trench coat with Lunar Watch patches, along with his dark gray leg warmers. He's also wearing an eye patch. "Howdy, Princess! Happy birthday! " He let out a small gleefully laugh at Blissy's remark. I'm sure you looked really handsome to all the mares! He turned his head to look at the new tree castle that loomed over behind some buildings in the horizon with a look of an impressed, before turning back to his friend. By the looks of it, princess Twilight really DOES have a castle of her own nowdays! 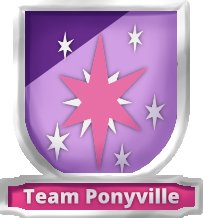 I really should come visiting Ponyville more if things will start changing around here a bit I guess? He stroked thoughtfully his chin beard with his hoof. What did exactly happened to her last home? Didn't she live in an ordinary tree house earlier somewhere around here? "Well I hope nothing serious came of that little situation Riley," she nodded to him as she finished the last of her brownie, smiling to Thunder Dash as he left to enjoy some dancing. "You didn't hear?" Bliss asked Polaris, "well according to my sources, while i was visting Empress Nortica at the Gryphon Empire, that creature Tirek was attacking Equestrians, he destroyed Twilight's orginal home!" Her mouth agaped a bit as she finished her punch, "luckily she along with her friends were able to defeat him though. Never would I imagine though that her victory would lead to her own castle!" Suddenly she leapt up into the air, startled by a familiar voice she wasn't expecting, turned around in mid air, and was happily surprised to see a familiar gryphon face. "ROAC!!! You made it too!" She dived on him, tackling him to the ground in a happy hug. "It's been so long! I haven't seen you since the Gala!" She looked at the looming large castle tree with admiration. For some odd reason it seemed to fit in the town of Ponyville. She felt more protected then ever with it being there for some reason. "somepony should have followed the orientiring lesson back at Cloudsdale"
"uhhhhhhhhhhh look at all of this stuff!!!" "HAPPY BIRTHDAAAAY!!! SEE?? I DIDN'T FORGOT YEAHHHHHH!!" "i am so happy to be here!!! ohhhh hell,i didn't forgot your present!" "i know it looks like nothing, just a coat right? well... it is spectra-infused, with a small circuit board of my creation, let's just say.."
".. that the immagination is the only limit!" "nothing special, just wear it, and think about a pattern you want in it! as already said, immagination is the only limit!" "whatever you wish on it, it will appear right as you want in your mind, i thought it was the right gift for the travelling rainbow princess! oh.. and since i am more like a pratical pony.. it has a small heating system if needed for long trips and an it has an anti lighting system, if you don't want to get struck "
"happy birthday Bliss! thousands of this year!" "I actually have a couple of transformation spells myself...." Thunder said as he walked over to Bliss. He suddenly turned and saw the pony who had crashed in. "Doc! I'm surprised to see you here!" Thunder said running over to Volt and helping him up. "Time sure does fly by doesn't it?" Thunder asked Volt. Her excitment only grew as Volt swept her off Roac and into the air in a blissful friendly hug. She hugged him back in return and pecked his cheeks happily. Before she could even speak her gratitude of his presence at the party, he hoofed her his present of a brilliant electroni/near magic coat, wrapping it around her and explaining how it worked. She nodded to him and focused on what she'd like the pattern to look like and...It started glittering in all colors of the rainbow, matching to her tail and mane, with golden lineing. "This is amazing Volt!" She whinnied and tackle hugged him again, "I could wear this without the fear of dressing so formally! I can just turn this into any cloak attire when I go to meetings! THANK YOU!"